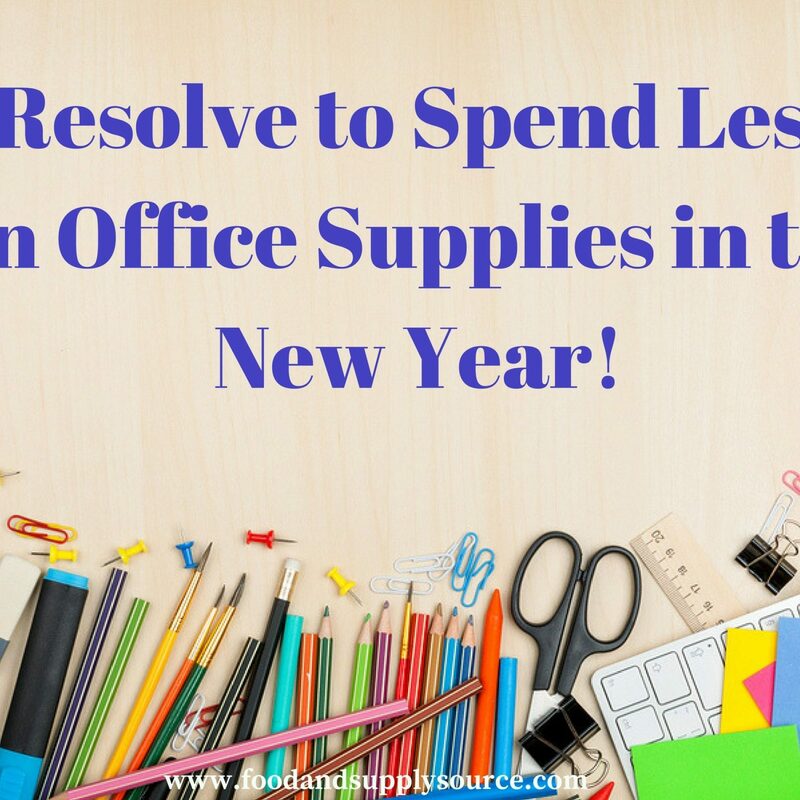 Home / blog / Resolve to Spend Less on Office Supplies in the New Year! Just about every business or organization across the United States is looking for new ways to reduce spending in response to budget cuts and the fiscal uncertainty seen in today’s economy. This is especially true for Head Start preschool and Early Head Start programs nationwide who are still struggling to recover from the Head Start budget cuts that came as a result of the 2013 sequestration. Sequestration cut more than $86 billion nationwide from just about every federally-funded program, from the military to housing and even including Project Head Start, which provides education, nutrition and healthcare to young children of low-income and struggling families. One of the best ways to reduce your spending and improve the bottom line in any office is to start by focusing on the money spent for office supplies. Head Start preschool programs use office supplies for book-keeping, paperwork, student files and just the basic day-to-day operation of their administrative offices, just like any other business. But with the Head Start budget cuts, administrators are looking for ways to cut spending rather than reducing staff or eliminating seats for students. Reduce Office Printing Costs by 25-Percent or More! One of the biggest areas of waste in office supply spending at Project Head Start or any other office that spends money on supplies is in printing costs. One study showed that the average office worker – just one worker – can use as much as 10,000 sheets of paper in a year. There are three ways that your Head Start preschool can reduce printing expenses right away, and that’s what we are going to focus on right here. One way to reduce the amount of paper that gets used each year and help accommodate those Head Start budget cuts is to use two-sided printing whenever you are printing a “draft” document. Another is to reduce the margin areas on each page, which can allow 10-percent more text on each page. Many businesses are turning to recycled or re-manufactured printer cartridges, which can save 25-percent or more each year. High capacity printer cartridges do save money on per-page printing over traditional, smaller sized cartridges. Contact a FREE service like SupplySource Plus, which conducts a free audit on your printing supply costs, purchasing and stock methods. This program has been shown to save Head Start preschool and Early Head Start programs as much as 10-35 percent each year on office supply costs, including printing costs. How Does SupplySource Plus Work? For services like Project Head Start that are working to reduce spending SupplySource Plus can be the answer to financial prayers. SupplySource Plus can quickly become your one-stop shopping supply, with a network of pre-vetted suppliers who work together to find Head Start preschool and Early Head Start program administrators the best possible cost on supplies. This will help you to overcome the 2013 Head Start budget cuts, which are still affecting many locations within Project Head Start, and prepare you for any fiscal emergencies in the future. SupplySource Plus helps Head Start preschool programs to reduce costs by guiding them to a smarter shopping plan, better stock monitoring and of course, aggregating all their clients together to boost your buying power. Even if your organization only makes a couple of office supply orders each year, SupplySource Plus can help reduce the impact of Head Start budget cuts and help you maximize the potential of every dollar you spend. How to Sign Up for SupplySource Plus Services? If you are an administrator with Project Head Start in your local community, just contact SupplySource Plus Services by calling their main office in Seekonk, Massachusetts at 508-336-6615 or by calling toll-free to 1-866-248-4520. You can also visit their website and use the handy online contact form to request a phone call or more information about the program. Head Start preschool and Early Head Start program administrators nationwide have been using the office supply purchasing program at SupplySource Plus for many years to reduce costs. In addition to office supplies, SupplySource Plus also offers discounted opportunities on purchasing janitorial supplies for your Project Head Start. For programs that are really looking to dig deeper and enjoy another 10-35 percent annual reduction in food costs from the Head Start budget cuts, SupplySource Plus has a sister business, FoodSource Plus, which can connect Head Start preschool administrators with discounts on quality nutritional food sources nationwide. Call SupplySource Plus or FoodSource Plus today to start saving on your office supply, janitorial supply and food supply costs immediately!